This catalog is designed to give prospective and current students, advisors, faculty, and friends of Willamette University an accurate picture of the curriculum, faculty, environment, and related subjects. Over the course of the years the current catalog will be in use, there will no doubt be changes in curriculum, faculty, and other important areas. Therefore, all provisions herein contained are subject to change without notice and do not constitute a contract or offer to contract with any person. Willamette University, the first university in the West, consists of the College of Liberal Arts, the College of Law, and the Atkinson Graduate School of Management. Cooperative programs enable all students to benefit from the quality curriculum available throughout the University. Willamette has long been known for its intellectual vitality, its cohesive campus community, its concern for each student, and its ability to balance a rigorous academic program with varied and successful extracurricular opportunities. In short, Willamette prepares students for successful professional and personal lives. Willamette faculty members are essential to this preparation. Bringing degrees from many institutions in other states and countries, faculty contribute a wide range of views and experiences to campus. With a student-faculty ratio of 10:1, all faculty are able to serve as advisors and maintain ample office hours. (Opportunities abound for students to interact both formally and informally with faculty outside the classroom as well.) Faculty members are engaged in scholarly research and publication and are given institutional support to pursue these objectives. However, the faculty is fundamentally committed to teaching. Willamette has a reputation for financial as well as academic stability. Its endowment is consistently listed among the largest of any college or university in the Northwest and compares favorably on a national basis. In addition to endowment income and tuition, it depends upon support through gifts and trusts. The campus has 40 buildings on 80 acres and comes complete with rustic gardens, native wildlife and a clear-running stream. The architectural character of the campus was set by Waller Hall. While the color of the brick and the green setting of Waller Hall is important, its scale sets it apart. The close integration between buildings and landscape has been achieved as the campus has evolved. The buildings have been highly articulated with faceted and interrupted wall surfaces and broken rooflines that merge well into the layered plantings. Thirteen residence halls provide over 538,710 square feet of living and activity space for students. Athletic facilities, libraries, student center and dining provide another 283,507 square feet. Classrooms, offices, both academic and administrative, are housed in approximately 582,238 additional square feet. During the past decade, including this 2007 issue over $65 million will have been invested in campus facilities. Renovations and additional buildings have enhanced every academic department on campus. Residence halls, administrative offices, and recreational facilities have also been renovated or refurbished. 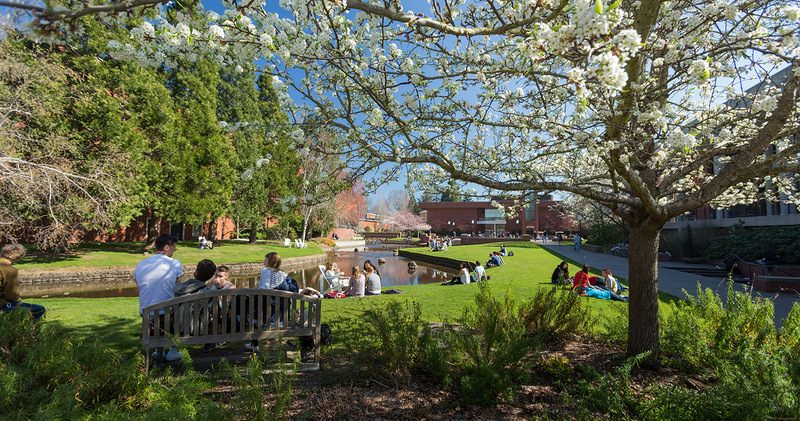 Adjacent to the campus and connected by a skybridge is Tokyo International University of America, the American campus of Willamette's Japanese sister university. TIUA offers classes in English and American studies to visiting students from Japan. Through a resident exchange program, Willamette and TIUA students have opportunities to be paired as roommates on both campuses. The close relationship offers a wealth of intercultural activities and opportunities for students of both institutions. Willamette benefits from its location across the street from the Oregon Capitol and near other federal, state, county, and city offices. In particular, this proximity provides students with exceptional internship opportunities. A large number of students also participate in the Community Outreach Program through widely varied volunteer service projects in Salem and the region. Nationally recognized for exciting, challenging and relevant undergraduate educational programs, the College of Liberal Arts sets students on a journey of intellectual discovery. Guided by our university motto, “Not unto ourselves alone are we born,” we produce thinkers, creators and leaders who use their talents and skills to improve their world. The balance of a liberal education with real-world experiences is essential to preparing our students for a lifetime of success. In addition, half of our undergraduates study abroad, while almost 70 percent complete one or more internships and a quarter participate in faculty-mentored research. College of Liberal Arts graduates credit their time at Willamette with providing them the expertise they needed for successful careers and lives as confident, self-directed and engaged global citizens.